Review of Flying Dog Gonzo Imperial Porter | Beer Apprentice - Craft Beer News, Reviews, Interviews and Info. 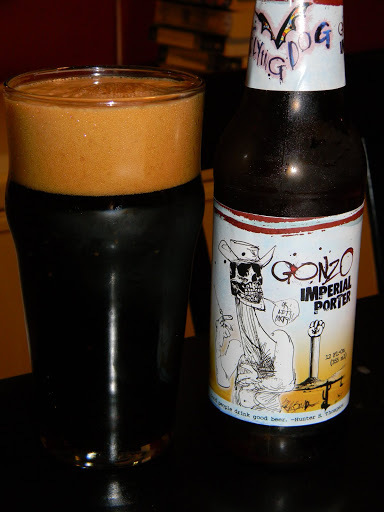 Today’s review is of the Flying Dog Gonzo Imperial Porter from the Flying Dog Brewery located in Frederick, Maryland. As I’ve stated before, I love Porters and Stouts, so I always get a bit excited when I know I have a good one to sample. I have tried several Flying Dog brews and all have been solid and well made, so I would expect nothing less from this one. Plus, I’m a huge fan of Hunter S. Thompson, so this has to be good, right? The website, flyingdogales.com, gives information excerpts from all the styles and the Gonzo Imperial Porter has a nice, quaint, inviting description. Gonzo is big, bold and beautiful like the man it was brewed in honor of – Dr. Hunter S. Thompson. Flavor notes: Roasted chocolate, coffee and vanilla malt flavors balanced with a unique hop bite. Pairs with: Mushrooms; smoked meats, BBQ and chili; hard cheese; chocolate and coffee desserts. This brew has a strong ABV of 9.2% and comes in a 12 oz. bottle with a cool little label. The appearance was a very deep, dark brownish/black color with very minimal ruby highlights around the bottom. A very thick, sturdy, tan head was produced from a semi-aggressive pour. It was very creamy and smooth looking and it stuck around for a good long while, but the lacing seemed to slide down the sides of the glass a little quicker than I thought it might. It still looked very inviting however. The aroma revealed a dark roasted, toasty malt that presented tones of fresh, ground coffee and sweet chocolate. I didn’t get much of a vanilla tone, which was mentioned in the description, but I did find a milky, almost “creamed wheat” type of aroma that was nice, not overly robust, correct and fitting. I didn’t find any dark fruit notes either, which seem to help typify most Porters that I have tried. As I brought the glass to my lips for the first sip, the taste imparted a very, very nice bittersweet chocolate with subtle coffee flavors. A negligible taste of alcohol that was nothing overpowering or distracting, but rather comforting. It started to develop a bit of a chalky profile as it warmed, along with a welcome hop bitterness that fell in line nicely and started to become more assertive as the analysis progressed. The mouthfeel was medium/full, very creamy, slightly chewy and smooth with a nice little hop bite. The flavor, literally, glides across the tongue and roof of the mouth and goes nowhere until the next sip refurbishes it. It finished with a very suitable dryness and a smooth alcohol warmth at the end. I happen to think this is a very solid, good beer. It’s balanced very well and is quite quaffable considering the high ABV. It would be more suited for the cooler months of the year, however I still think I could set a few of these back without batting an eye at any point during the year. It’s, for sure, worth a try if you see it and also if you favor the dark, roasted malts that accompany the Porter style. Thanks again for reading guys. Hope all is going well and that you are finding the reviews helpful and/or entertaining.